Cumin seeds are a flavorful spice that is commonly used as part of curry powder, but you can use this seasoning on its own, as well. 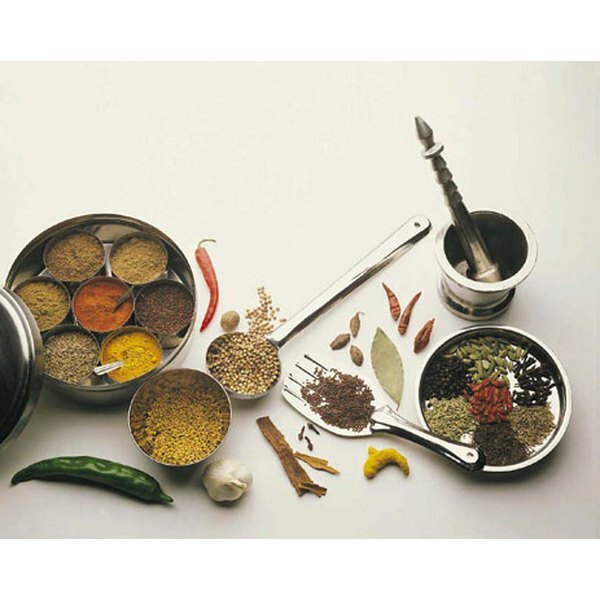 Many regional cuisines use cumin seeds, and the spice is found in many Indian, Mexican and Mediterranean dishes. Cumin seeds are low in calories, so using this spice to flavor your foods can be a better choice for weight loss than other, higher calorie flavoring agents. Cumin seeds can be suitable for weight loss due to their low calorie content. Each 1 tbsp. serving of cumin seeds contains 22 calories, which is less than some other flavorings, such as peanut sauce, which contains 35 calories per 1 tbsp. Because of the low calorie content, you can burn the calories in cumin seeds relatively quickly; three minutes of swimming laps would burn more than 22 calories. Cumin seeds are relatively high in fat, considering the low calorie content. Each 1 tbsp. serving of cumin seeds contains 1.3 g of fat, which contributes more than half of the calories in this spice. While dietary fat is calorie-dense, it can aid in weight loss because it provides feelings of satiety. Cumin seeds are relatively low in carbohydrates, with 2.6 g in each 1 tbsp. serving. Consuming a low-carbohydrate diet can be helpful for weight loss, so you may find cumin seeds more appropriate than something like barbecue sauce, which contains 7.5 g of carbohydrates in a 1 tbsp. serving. Each 1 tbsp. serving of cumin seeds contains .6 g of fiber, a nutrient beneficial for weight loss. Fiber helps promote satiety, so fiber-rich foods may help you control your appetite. Cumin is a rich source of calcium, as each 1 tbsp. serving contains 56 mg. Calcium is a vital nutrient that promotes bone health, but it may also aid in weight loss. An analysis of studies published in the June 2011 issue of "Nutrition Reviews" concluded that calcium supplementation can promote significant weight loss. Which Fruit Seeds Are Poisonous? Do Anise Seeds Control Gas & Bloating?